When one of your best employees gives notice out of left field, you’ll certainly be wondering why. As it usually turns out, they had been thinking about it for months and consulting with friends and family. The one person they should have clued into that conversation was YOU, their manager. Their decision to leave could have potentially been avoided with a real conversation on whether they felt valued or if they felt they had the potential to grow within their role at your company. Unfortunately, this is a crucial conversation managers and employees completely drop the ball on. LinkedIn research points out that one of the main reasons people quit their job is lack of career advancement; because they feel like they’re unable to do so in their current role. A recent Alight workforce study reports that 78% of employees expect managers to discuss career and learning opportunities with them and that shockingly only 37% of employees feel managers do this well. What do you do when your team members feel like they can’t talk about career development? Block out the time in your already-packed schedule to sit each one down for a real conversation about it. As you look further into your staff, you will be more in tune with what’s necessary to move them forward. Being able to provide employees with their advancement is a major key to retaining your team members. This shows them that you are proactive and working to help them do their job well. After all, one of the best traits of a successful leader is knowing what your team requires in order to perform well and grow within your company. Now that your employees can be open and honest about what they need, you are the one that can provide the resources they need to grow. Maybe one of your employees has mentioned that one day they want to run their own team. Provide them with a project that requires extra responsibilities that can give them the opportunity to use their strengths and learn from their weaknesses. Incorporate continuous training programs for employees into quarterly or annual calendars and budgets. This could include educational classes, technical skills training courses, management training workshops, or connecting them with an in-house mentor. You can host motivational speaker events where you provide lunch and invite an industry expert in to speak with your staff. There are so many developmental resources available: Udemy, LearnUpon, Hogan Assessments, or MOOCs just to name a few. Your company’s success is dependent on your employees so retaining your best talent is vital. Create an atmosphere where your employees are excited to talk to you about their career development and their opportunities for growth. Show them you are invested in them and their success by approaching managing them in a holistic approach. You must define clear expectations of them, check in regularly, and provide the tools they need in order to successfully perform to both of your expectations. Successful and happy employees are a critical ingredient to being a great manager. 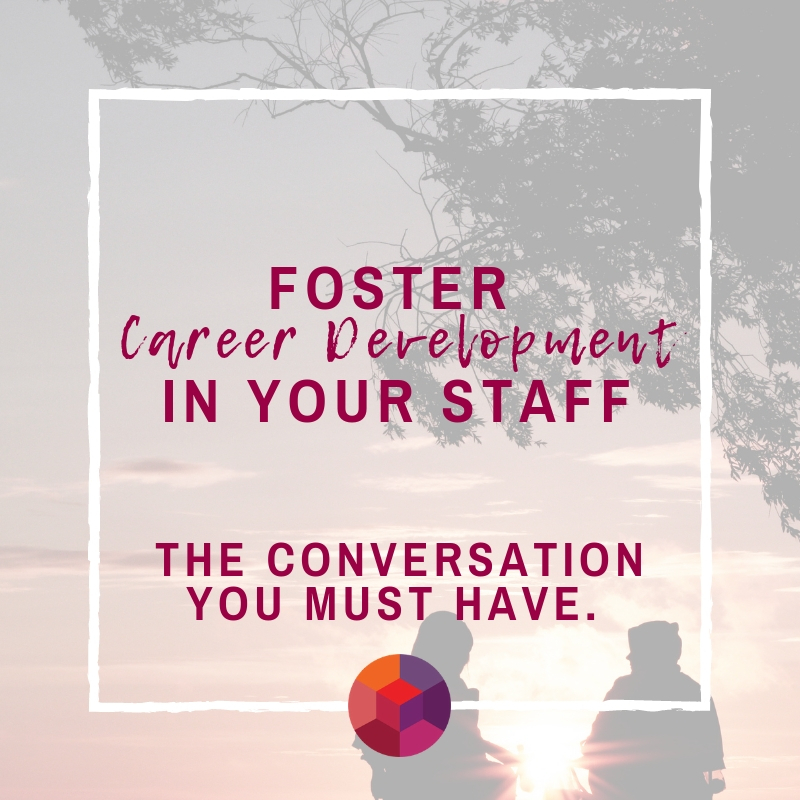 So, be sure to continue to have open conversations with your staff and provide the upmost resources to foster career development to keep the symbiotic relationship strong.